he Meta Incognita Project was initiated to cast new light on the Arctic voyages of Martin Frobisher and their significance for the histories of North America and Britain. The papers published here are the result of several years of research in British and European archives, undertaken by an Archival Research Task Force set up in England under the chairmanship of Sir Ian Gourlay and with the guidance of the Meta Incognita Project Steering Committee. Leading scholars have broken new ground in examining the sociopolitical, technological, and historical contexts, the conduct of the expeditions, the roles and complex motivations of some of the key players, the significance of the voyages for the future both of English oceanic exploration and of imperial and entrepreneurial ambitions, and questions about intercultural contact between Inuit and Europeans. Although the Elizabethan venture failed in its goals to discover a northwest passage, to mine precious metals, and to establish a colony in the future Canadian Arctic, it left valuable legacies which have not been fully demonstrated until now. The collection Meta Incognita: A Discourse of Discovery. 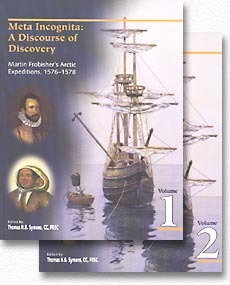 Martin Frobisher's Arctic Expeditions, 1576-1578 is edited by one of Canada's most renowned scholars, Professor Thomas Symons, chairman of the Steering Committee. 21.5 x 27.6 cm, 636 pp. How Strange is a Stranger?